It is one of those weeks where there seems to be so much going on, I can’t get my thoughts straight enough to write a new blog post. It is all good stuff though – I feel like I am about to emerge from the wilderness of Too Much Work, in Too Little Time, into a period of comparable calm. This week marks the final week of the Prison Project. We are at the recording stage and the musicians, DF Sound Designer and I spend Monday in the studio. Tomorrow (Friday) we will be joined by Mr B, the guitarist and music teacher based in the prison. All the prisoners and children we have worked with are preserved in the project via the recordings we made in the workshops. Monday’s in-studio time was great. We listened to some of the tracks that DF and I have put together, interweaving voices with music from our many improvisations, and added some further solos, riffs and vocals. Altogether we will have about ten tracks. Tomorrow we will get the guitar tracks down, record another solo Bach piece, and when we’re all done go for celebratory lunch, as it has been quite a bonding journey for us all. Also this week, my 9am class at the University performed their end-of-term compositions. These are first-year Bachelor of Education students, completing a Primary Classroom music unit over 9 weeks, and they have to create an original composition, inspired by a chosen stimulus, working in small groups. I was thoroughly impressed with their work. Their pieces had structure and clarity, were very well-rehearsed, took risks with the new music skills they have been learning, were bold and innovative…. it was fabulous to see the performances one after the other. I don’t think I have ever had all the groups in a class score so highly. Today I met with SY, the drama and story artist I collaborated with for a Professional Development day for teachers earlier this year. We met up to talk through the various pitfalls of freelance work as an artist working in schools and with teachers, designing and teaching content. I wanted to pick her brains about conference work, and how she sets about generating new work. She had lots of useful things to share with me, but even more importantly, it was so valuable to be able to sit down together and talk through the work, and various issues that arise with different employers. We talked a lot about money – setting fees, negotiating and communicating these agreements without putting people’s noses out of joint who think you should be cheaper. I have been doing a bit of reading about Teaching Artist issues lately (as I ponder my future existence and if I want to stay in this line of work for much longer) and want to share a couple of interesting articles. The first (here) is a very comprehensive set of ground rules for artist-school partnerships; the second (here) a ‘wish-list’ for Teaching Artists. Both come from the United States, where issues seem similar to here, but where perhaps dialogue is more established. I am thinking a lot at the moment about a career change. I am good at what I do – really good – and dedicated, with a growing profile, but the money is so poor! As life gets more and more expensive I have to consider how sustainable the work I have chosen to pursue actually is. A few years doing something less artistic could be a good way to go. I don’t know though. I would miss it. And I have worked so hard to build what I have. No decisions yet – and no rush! My main priority in 2008 is to finish my Masters. But after that….who knows? I am thinking about that time, at the moment. It has been a productive few weeks at the Language School recently, as we gear up towards our performances for Refugee Week and the end of term. We are well on track. I use the whiteboards constantly in the music class, as a way of giving additional visual information and reinforcement, but also as an important tool in songwriting, and structuring more complex performance pieces. Here are a couple of images from recent classes, brainstorming words for songs and chants about life after re-settlement in a new country. I had my first productive lesson with Lower Primary students all term yesterday. The odds were stacked against us – it wasn’t my usual day, they weren’t with their usual teacher, and I worked with them straight after lunch rather than first thing in the morning. However, the lesson went very well! So what did we do this week that so captured them? 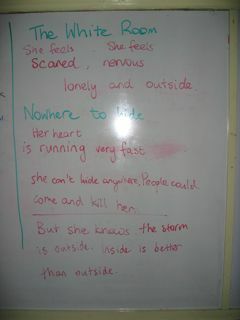 The focus of this week’s class was on writing a song together, on the theme of ‘names’. Regular readers of this blog will know that the children in this class have spent the whole term using rhythms derived from the syllables of their names to compose instrumental pieces, both melodic and purely rhythmic. I wanted a song to tie all of these sections together. We started with a quick warm-up. I got straight into it, with no preamble or explanation. I started a clapping pattern and they followed. Then we said our names 1 x 1 around the circle. We did a big stretch to get the oxygen flowing, and then we sat down on the floor and I asked them all to face the white board. 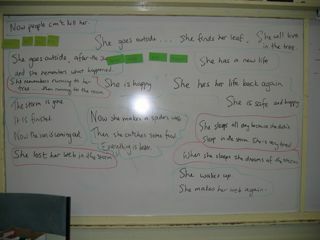 We brainstormed sentences with the word ‘name’ in them. What is your name? That is my name. Why do we have names? I asked, hoping to get some more unusual sentences. But that was a difficult question for them to answer. I didn’t push it, but kept things moving. Brainstorming words like this can be tricky for those children with less English, or who struggle with reading. I didn’t want to spend too long on this task. Very rapidly I scanned our list of words and sentences and started to pull some out that I felt had strong musical qualities. I asked Ally (our music intern student from Melbourne University) to play a simple ostinato on the notes C and G on the violin. I invented the first line, and said it to them, and asked volunteers to sing it back to me, looking for a possible melody. We then, together, chose another 2 lines, devised melodies for them, and our song was complete. After this, we passed untuned percussion instruments out among the class. Some played djembes and drums, the others a variety of small hand-held instruments (cabassa, guiro, tambourine, wood block). In two groups, we played the name-rhythms we had invented in previous weeks. We then practiced alternativing singing the song with playing the rhythms. This took us up to the end of the lesson. In all I had their full and focused attention for an hour. Given that in last week’s lesson there was defiance, tears and uncontrolled giggling, I felt very relieved! Here is the song we wrote, which I personally think is quite delightful! Tell me, tell me, tell me, what’s your name, what’s your name? What is a name? A name is what we call you. This is my name. What is your name? “You look tired,” said one of my students when I walked into the room today. They were all waiting for me, (I hadn’t realised that we’d be starting earlier today), smiling warmly. I have so much tension at the moment, so many thoughts driving around in my head, but I felt myself start to ease off, and dropped myself into the day’s activities. It was a pretty satisfying day at Language School, overall. Lower Primary were a little tricky – they have become progressively more tricky this term, not less. It is very, very hard to keep them focused. I have picked up the pace of all my activities, I am talking as little as possible, I am reinforcing the music room rules (‘good listening, good looking, good waiting’) at every opportunity, but still trying to see through the composition project I had planned for them. It is uphill work! We finished today’s lesson by recording their glockenspiel playing, then I showed them a short DVD clip of my nephew (aged 2 and 1/2) playing home-made drumkit, while wearing a nappy. He (my nephew) has all the rock star moves. His drumstick work is pretty impressive too. The Lower Primary children really enjoyed watching this, so I should dig out some more clips for them to watch of other children playing instruments. My happiest lesson today was with Upper Primary. We composed the last part of our Aranea music. They were so focused through the whole lesson, offering words, developing melodies, and repeating the song as it progressed. I am happy with it. It has a catchy chorus, it has a chanted section, and has a bridge that adds tension and build-up, and it has body percussion. I think they will perform it well. The process? We brainstormed words, describing the spider’s situation after the storm (tiredness, remembering the terrible experience, finally going outside, finding a new place to live, rebuilding her home), then we organised these ideas into a chorus, a verse, and a bridge. I had already planned a simple chord progression to work with (Dm, Dm, Gm, A) – we set this up as an accompaniment and experimented with melodies. She goes outside, She finds her leaf, and remembers what happened. She is so tired, but when she sleeps, she dreams about the storm. Now she makes her web. Now she catches food. Everything is better now. She has a new life, safe and happy, She has a new life, safe and happy. And she will live in her leaf in the tree. The last line is quite a tongue-twister for the students – lots of ‘Ls’. Despite being in a minor key, the song has a lot of energy and uplifting feeling to it. This is music that we will perform as part of a Refugee Week concert, in a few week’s time. I am hoping to project images from the book at the back of the stage while the children perform, as well as images that they have drawn depicting their own journeys to Australia. A good day’s work. Maybe I’ll take the night off. I’d like to indulge in some retail therapy, but it is not a good idea. Life is so expensive these days. My trip to Bologna (to the International Society of Music Educators conference) is going to cost me a lot (even with the airfare paid for), and is not something I had budgeted for. Maybe instead I will watch a DVD. I have an Italian postwar realist film out from the library at the moment. Might settle in with that on my computer. I spent the day at DF’s studio (he being the sound designer on the prison project I have written about recently). We had the task today of going through all the recorded footage from our workshops in the prison, and with the children and families of prisoners, and selecting the excerpts we know we want to work with in our recording sessions with the orchestral musicians. It was a big task, as we recorded everything that took place in our workshop sessions! But I am writing this at 6pm and we are ready for our next studio day. We have a project title, and subtitles for four sections. We have started to plot where the musical and spoken excerpts fit in each section. We are also gathering short excerpts that could work well as transition music/sounds. Section 1 – What do you see when you look out a light window? Section 2 – What do you see when you look out a dark window? Section 3 – What do you hope to see through your window? Section 4 – What is the most special or beautiful thing you have ever seen through a window? We have two songs, with words drawn from poems written by two of the guys (and sung by our multi-talented roadie). One of the songs is linked to a much longer instrumental piece. We also have a number of guitar loops, that were the starting points for long improvisations in our workshops. When we meet again next week, DF and I will first pull out all the short excerpts we want to use, and place them in the most appropriate section. We didn’t have these titles already in mind when we conducted most of the workshops – the idea only came about in our final workshop in the prison. However, lots of the material we have fits under one of these subtitles or themes. We are working in ProTools. I’ve been feeling worried about the enormity of this aspect of the prison project – recording work can be so time-consuming, and it is hard to predict how long it will take. Our timeline, however, is completely set and inflexible. Our studio time is already booked (from about 12 months ago). We need to get approval from the Prison Management on the raw footage we want to work with, before we can start moving it around and putting effects on it, or processing it and arranging it in other ways. I have CDs to send them first thing next week. But it feels good to have met with DF today, and to start going through all that we have. Now I can at least be starting to shape it in my head a bit more. I’m still feeling a bit weak and weary with life in general. 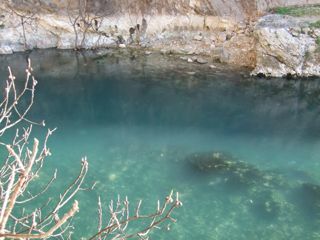 Here is a ‘clear water’ image from Blagaj, Bosnia-Hercegovina – a place where I used to love to sit and just be still and calm and empty of all thoughts. I feel tired and sluggish today, so don’t think I achieved a great deal. I did a couple of interesting things – went to a seminar at the University by an Italian academic named Roberto Fini. He spoke about the inequalities in the Italian education system. It was very thought-provoking. He spoke in Italian, and while there was another academic who translated for him, I enjoyed following what he was saying in Italian, and then seeing how accurate my understanding had been. I need to replace my computer bag so I went into the Apple Shop in the Union building and looked at the range there. It is hard to find a good bag with backpack straps that looks stylish and isn’t covered in straps and clips and webbing and other ‘sporty’ looking things. I have a Crumpler laptop bag (it was very expensive) but the bag design doesn’t really suit me so I want to sell it and find something that works better for me. Today I was just looking, not buying or deciding. Then onto to an Action Meeting for the Bologna conference. There are three of us working on a Seminar for the conference – preparing documents, invitations, lists, freight. I will also be presenting my research work-in-progress in a Student Research Dialogue. In fact it was a very productive evening – but that kind of productivity is normal for me now – admin tasks done at a speedy rate is how I have to approach every single day I am in the Orchestra office. No cruise time there (as I said a couple of days ago). So I just open up the laptop and power though the documents and cross things off the To Do list. No, what was missing today was reading. I didn’t get to my reading list at all. At the moment I am working my way through a number of books on Interviewing Children. I still need to source books and articles that deal specifically with eliciting responses through visual and creative means, and ways of interpreting this kind of data. So far my database and catalogue searches have yielded nothing very specific. Suggestions, anyone? Everyone sits on the floor in a circle. I ask a few random people to go grab a chair, bring it back to the circle and sit on that instead. Once everyone is ready, I explained to the group that I was going to do some clapping and I wanted them to listen and look carefully. Sometimes they would hear 2 claps, sometimes only 1. They had to try to work out what the rule was. Their class teacher figured it out first, so I asked her to give the class a clue. “You have to watch G’s eyes,” she said. I clapped the pattern again. There were a few “oh!s” around the group as they started to form their ideas. I asked a couple what they thought the rule might be. The 2nd or 3rd child worked it out – that all those sitting on the floor got one clap, all those in a chair got two claps. And, I added, we start ‘reading the circle’ with me, and we finish with me. Now that the rule was explained, we clapped the circle together, slowly. We did it a few times. The group was pretty accurate. I noticed that one or two were not quite getting it – one of the Chinese girls, who simply wasn’t looking at anyone in the circle (so trying to guess, or memorise), and Edwina, who was watching me intently, and copying what I did, reading my gestures in order to know when to clap once or twice. She wasn’t looking around the circle – she was only watching me. We added a third element – several people standing up. They were worth three claps. We read the circle again, and after a few fairly accurate read-throughs stopped the game at that point. My three composition projects at the Language School are progressing well. Tonight I want to spend some time reflecting on each of them. My overall theme this term was to build pieces around journeys and identity; with the Lower and Middle Primary classes I also wanted to work on their pitch awareness, and start to hone their understanding of high and low notes, and how different pitches related to each other. ‘Identity’ is a big starting point for this age group – especially when there are lots of students with very little English, and a significant gender imbalance in the group (only 2 girls) which changes the energy, focus and behaviour styles in the group. I find I often start with, and come back to, names – the children’s names. You can get so much musical mileage out of names. In this project, we have practiced clapping the syllables of all the names in the class. We string several names together in a row and clap the syllables one after the other, to make a longer rhythm. We set up two strings of rhythms and divide into two groups, and clap them at the same time. We practice our rhythmic skills by doing lots of ‘call and response’ rhythms, and multiple rhythm layers games, which teach the children to be aware of, but not put off by, more than one rhythm being performed at a time. Last week we divided into two groups and performed the rhythms consecutively (4 repetitions each), and then concurrently. I want them to get used to playing a number of repetitions in a row, then stopping, but counting the other group’s repetitions, then starting again. Looping this kind of pattern over and over, often enough for them to start to feel instinctively what 4 repetitions feels like.